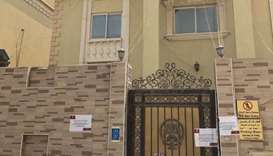 The Ministry of Economy and Commerce (MEC) has announced the one-week closure of a phone shop located in the Al Rayyan area for displaying and selling counterfeit batteries bearing international trademarks. The Ministry of Economy and Commerce (MEC) has announced the two-week closure of a phone shop located in Al Rayyan for displaying and selling counterfeit batteries bearing international trademarks. The inspection campaign held by representatives from the Ministry of Economy and Commerce (MEC) in August, resulted in seizure and issuance of 51 violations. Ministry of Economy and Commerce is taking part in the three-day International Products Exhibition and Conference 2018 (IPEC) that begins at the Doha Exhibition and Convention Centre here on October 8. 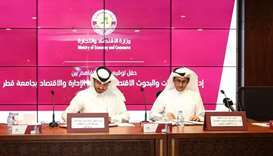 The Ministry of Economy and Commerce (MEC) signed Tuesday a Memorandum of Understanding (MoU) with Qatar University (QU), to promote co-operation across various economic research fields. The Ministry of Economy and Commerce (MEC) has announced the two-week closure of a beauty salon located in Al Gharafa over the display and sale of expired products. The Ministry of Economy and Commerce (MEC) has announced the one-week closure of a beauty salon located in Al Waab over the use of expired products. Inspectors also found violations that included charging a price higher than the advertised price and not issuing invoices. The inspection campaign falls within the framework of the MEC’s efforts to regulate and monitor markets and commercial activities. 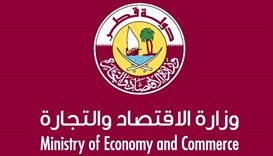 The Ministry of Economy and Commerce (MEC) has said it is pursuing its intensive inspection campaigns in the run-up to Eid al-Adha.